Providing a convenient online Home Equivalency Calculator to help you understand how the value of your current home translates to a better value (in most instances) in Arizona luxury real estate. A deep understanding of everything Southwest. Living here in this part of the country is more than just a location, it’s a lifestyle. Understanding all the riches of the Southwest provides is essential to the success of your long distance purchase of Arizona luxury real estate. That’s why we do more than just provide you with information on amenities, schools, communities, arts and entertainment, dining, shopping, gated communities, and much more. Our team has lived here for decades so we know firsthand. An understanding of your unique needs from a distance, whether it is out of state or out of the country. 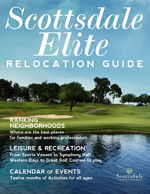 Guides for buying your Scottsdale luxury home specific to the out of state buyer and international buyer.